The war memorial, a rectangular stone block surmounted by a cross, is situated in the grounds of Holy Trinity Church, Doynton, Gloucestershire, UK. It bears 9 names from the First World War. 2nd Lieut Davy served with the 6th Bn. Somerset Light Infantry, died on Friday 18th August 1916, has no known grave but is commemorated on the THIEPVAL MEMORIAL, Somme France. Sergeant Selman served in the 8th Bn. Gloucestershire Regiment, died on the 28th March 1918 and is commemorated on the ARRAS MEMORIAL , Pas de Calais, France where he is recorded as Prvt. W Selman. Bmbdr. William James Whale of "G" Battery, Royal Horse Artillery died on Tuesday 29th December 1914 aged 25 yrs. He was the son of George and Martha Whale of Doynton and is buried in BOULOGNE EASTERN CEMETARY, Pas de Calais, France. Gnr. George Henry Fletcher died on Thursday 7th September 1916 aged 37 yrs. He was the husband of Mrs M S Fletcher of School Road, Oldland, Bristol. Prvte. W J Ashley of the 1st/ 5th Bn. Somerset Light Infantry, died on Friday 23rd November 1917 aged 38 yrs. He was the husband of Lily Ashley of Crook Lane, Timsbury, Bath. He is buried in JERUSALEM WAR CEMETERY Israel. Prvte George E. Drew of 1st Btn. Gloucestershire Regiment, service number 5472, died on Monday 21st December 1914 aged 35 yrs. He was the husband of Mary Ann Drew of 21 Hopewell Street, Gloucester. He has no known grave but is commemorated on the LE TOURET MEMORIAL, Pas de Calais, France. Prvte. Lewis William Drew of the 2nd Bn., Gloucestershire Regiment, service number 8753 is buried in St Sever Cemetery Rouen. Grave A.4.22 Commonwealth War Grave. George & Lewis Drew were brothers. They were the son's of Joseph Drew and Elizabeth Drew nee Amos. Prvte. F V Radcliffe should read Prvte E V Radcliffe ( Ernest Vivian Radcliffe) of 19th Btn. Royal Welsh Fusiliers. He died on Monday 22nd April 1918 aged 34 yrs, has no known grave but is commemorated on th POZIERES MEMORIAL, Somme, France. He was the husband of Dorothy Radcliffe of 94 Shakespeare Avenue Bath. 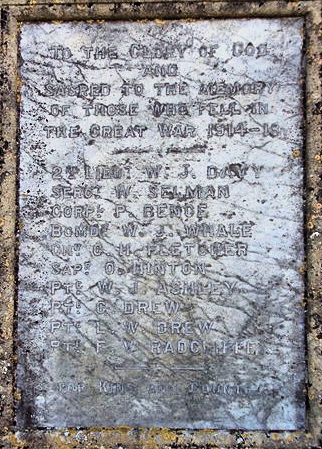 Doynton War Memorial photograph and additional information on George and Lewis Drew provided by Amanda Bradley.